The asteroid that smashed into the Earth 65 million years ago, triggering a mass extinction that wiped out the dinosaurs, also drove a persistent bout of lethal global warming, the Independent reported. Temperatures across the planet’s surface increased rapidly by 5C, and remained that high for the next 100,000 years, according to a new study. Scientists think this sudden rise, which contributed to a wave of extinctions that swept the planet, is comparable to the global warming that is currently gripping the planet. Dr Ken MacLeod, a geologist at the University of Missouri who led the research, said the impact of the infamous Chicxulub asteroid would have triggered wildfires that burned for months. This would have been exacerbated by ferocious lightning storms that continued long after the event. “You have a period of years to decades where you’re pumping large amounts of carbon dioxide by burning everything on the surface of the Earth into the atmosphere,” Dr MacLeod told The Independent. This led to rapid warming due to the influx of greenhouse gases into the atmosphere. While the Earth has gone through many phases of intense heating in its long history, many of which left large swathes of the planet completely uninhabitable, what Dr Macleod noted about this period was its similarity to human-induced global warming. “What’s unusually comparable about the Cretaceous–Paleogene boundary and the modern is that the rates are so similar,” he said. 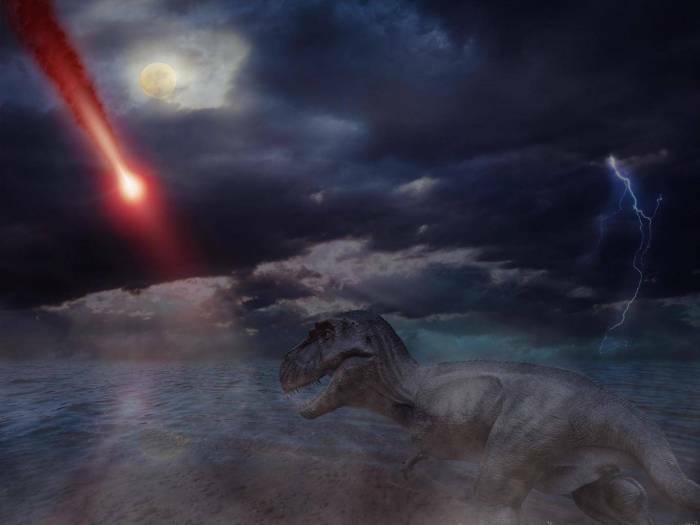 A period of warming following the Chicxulub asteroid has long been postulated by scientists, but they lacked the data to support it. To understand this phenomenon better, Dr MacLeod and his research team examined a collection of fossilised fish teeth, scales and bone – no bigger than grains of sand – from a site in Tunisia. These tiny samples retain chemical signatures that indicate the temperature at the time when the ancient creatures died. Traditionally, this technique for estimating past temperatures uses ancient shellfish – but many of the species geologists usually study went extinct following the impact. Instead, the scientists were able to piece together the history of the time leading up to the Chicxulub impact, and the time afterwards, using resilient fish that survived the shock. From this analysis they were able to come up with their 5C figure, a result that matched previous work exploring the levels of carbon dioxide that were emitted following the mass extinction event. “We were quite concerned we would get muddy, uncertain results and we were absolutely thrilled that they came out as clean and dramatic as it did,” said Dr MacLeod. While it is likely the dinosaurs themselves were wiped out by the wildfires and other natural disasters that followed the asteroid’s impact, Dr MacLeod is “willing to bet” the global warming that ensued polished off many of Earth’s remaining creatures. “Marine creatures that are sheltered from wildfires that might survive those decades of disaster could very easily be ones that were done in by the global warming pulse,” he said.